Last Updated: 9 April 2019 - This post contains affiliate links. If you’re in the market for a bullet blender which can make your stock-standard cold smoothies as well as blast a hot soup…keep reading. In the Nutribullet family of blenders, the RX is the most powerful and the most versatile since it can blend cold foods, and pump heat into soups and sauces as it blends. How does the Nutribullet RX compare to other bullet blenders? Is the sauce and soup function really worth it? How exactly does it heat and cook food? How does it handle ice? What are the main pros and cons? 1 What Interesting About The Nutribullet Rx? 2 What do other customers and reviews say? 3 How Does The Nutribullet Rx Measure Up To The Vitamix in Terms Of Absorbing Nutrients? 4 What you get with the Nutribullet Rx? 5 What are the technical specifications? 6 How do you use it? 7 Can I Put Ice In My Nutribullet Rx? 8 How Does The Nutribullet Rx Heat And Cook Food? 9 How Loud is it? 10 How do you clean it? Is it easy to clean? 11 What are the most common Problems With the Nutribullet Rx? 12 How Does It Compare to other models? 13 Are there other replacement parts or accessories? 14 Can I find it at other retailers such as costco, kohls, Macy’s, Target, Walmart or Walgreens? 15 Where Can I Buy a Refurbished One? 17 What’s The Best Price For The Nutribullet Rx and where can I buy it? 18 Verdict: Is This Blender For You? What Interesting About The Nutribullet Rx? First of all, the Nutribullet RX has a heating function for soups and sauces. You load the “souperblast” pitcher with your ingredients, screw it onto the base, and press the “g” button until it turns red. The 7-minute cycle will begin, blending and heating the soup, before automatically turning off. It doesn’t have a heating mechanism per se, the heat comes from the speed and duration of the spinning blades. Note: you never put hot liquids into the RX, you start with cool or lukewarm liquids/ingredients and the blender will heat it for you. I add that because I personally would probably make the silly mistake of thinking that if the RX is safe to heat things, it’s safe to blend already-hot ingredients. Second interesting factor to note, the RX has a super-high wattage of 1700. This is pretty colossal compared to other Nutribullets, such as the Pro 900 which has, well, 900 watts of power. At 1700 watts, you’d hope for the smoothest smoothie ever, with not a chunk in sight. We’ll assess this factor further below. Lastly, the RX comes with a little tool to tighten or loosen the blades. Sure, this isn’t riveting information, but it does seem important considering the fact that hot soup is going to be coming out of the machine. For this reason, the tightening tool is handy to ensure the blade assembly is tightly screwed onto the Souperblast pitcher to prevent leakage. It also helps for when the blade assembly expands due to the heat, and becomes too hard to unscrew by hand. It’s interesting and useful to note that many reviewers have urged existing and future RX owners to always use the blade tightening/loosening tool when removing the blade housing from the vessel. They say that this ensures that the rubber gasket stays put, and doesn’t slip out, like many customers have experienced. What do other customers and reviews say? As of now, the reviews are very varied. The 5-star section has 62% of the votes, and the 1-star section has 14%. This tells us that yes, there are some stellar features to behold, but there are also some pitfalls to be aware of before handing the cash over. Let’s see what has thrilled and disappointed customers. Easy to use: many customers who left happy reviews noted how easy the RX is to use. They like the one-touch button, hands-off blending, and easy clean up. Powerful: the powerful, 1700-watt motor is a popular feature in the positive comment sections. Customers mention the smoothness of their smoothies, with no chunks or gritty texture, and they attribute this to the powerful motor. Easy to clean: thrilled customers rave about how easy the RX is to clean. Either rinse it out and leave to dry, or pop into the dishwasher for a more thorough clean. No pulse feature: some people have found the lack of a pulse feature disappointing. This isn’t a biggie, just a matter of preference. Loud: the loudness of the RX has come under fire in negative reviews, but I think it’s just something you have to accept when using a super powerful blender. You could buy a blender cover to muffle the sound. Leaks: quite a few unhappy customers have found that the RX leaks from the bottom, through the blade housing and into the base. Others have found that a greasy, dark substance leaks from the blade housing into the cup, contaminating the smoothie/soup. Gasket ring comes loose: this is by far the most common complaint in the negative review sections. It’s quite a problem for many people, as they find the rubber gasket pops out of the blade housing, and even gets stuck or chopped up as the blender blends. Others have stated that this can be completely avoided if you use the blade tightener tool each time you secure and remove the blade housing to the cups or pitcher. This is a common complaint across the board of Nutribullet models. Some suggest to keep the blade out of the dishwasher as the heat can cause the gasket to slip. How Does The Nutribullet Rx Measure Up To The Vitamix in Terms Of Absorbing Nutrients? It’s tough to say. The RX does have a higher wattage than all Vitamix blenders, at 1700 watts. We could assume that this extra power means that the foods are broken down to a smaller level, thus increasing nutrient absorption in the body. However, different foods require different levels of breakdown to release the most nutrients, so it’s difficult to make a good comparison between blenders in terms of nutrient absorption. The short answer would be: they both blend foods very thoroughly, and the difference between nutrient absorption is most likely pretty minimal, if any. Also note: when it comes to hot soups made with the Nutribullet RX, some nutrients may be lost. Enzymes which are heated to a certain point are destroyed. (This is why masticating juicers are more popular than centrifugal juicers when it comes to nutrients, as they don’t heat the produce…but that’s a totally different tangent). What you get with the Nutribullet Rx? The new model comes with in a 12-piece set, including a hardcover recipe book. For the “Nutriblast” cycle, which is basically just the normal smoothie function of the RX, you simply place the filled and secured vessel onto the base and press the power button. The button will glow green and the blender will run for one minute before turning off. The power button glows red during the “Souperblast” cycle, and runs for seven minutes, heating the ingredients as they blend. Can I Put Ice In My Nutribullet Rx? Yes, you can. You can use it like a regular blender for smoothies, shakes and frozen drinks. The 1700-watt motor smashes through ice really thoroughly. Many happy customers have left reviews raving about how their RX blends ice into a lovely slush. How Does The Nutribullet Rx Heat And Cook Food? The Nutribullet RX comes with a special pitcher and vented lid to make what Nutribullet marketing calls “souperblasts” (yes, you can just called it soup). Once you’ve loaded the pitcher with soup (or sauce) ingredients and screwed the vented lid on top, you screw it into the base. Press the “g” button on the Magic Bullet symbol at the bottom of the base until it turns red, this will turn on the heating function. The RX will then begin a 7-minute cycle of blending which creates heat due to the rapid speed of the blades. There’s no actual heating mechanism in the base, the heat simply comes from the friction created from 7 minutes of 1700-watt blending. The soup reaches up to 150 degrees Fahrenheit. It’s pretty loud, as you might expect from such a high-powered blender. There are blender covers on the market, designed to muffle super-loud blenders. How do you clean it? Is it easy to clean? Yup, it’s easy to clean and the cups and lids are dishwasher safe too. You just need to remember to rinse the blades immediately after use, to ensure smoothie and soup residue doesn’t dry and stick onto the blades. The blades shouldn’t be put into the dishwasher, as it can damage the gaskets. It’s best to give the blades a rinse and a quick scrub with a brush, then leave to dry. What are the most common Problems With the Nutribullet Rx? The rubber gasket can come out: by far, the most common complaint, as we learnt earlier. Many people have found that the rubber gasket pops out of the housing, and sometimes even finds it’s way into the blades. Others are adamant that this is completely avoidable if the blade remover is used to remove the blades. Some reviewers have explained that by removing the blade with your hands, you are squeezing the housing from the outside, therefore creating a large enough gap for the gasket to slip out of. Whereas, when using the blade remover, the housing remains unchanged. Leakages: leakages are also a reasonably common issue with the RX. Some people experience leakages from the blades and into the motor, while others find that an odd substance leaks from the blade housing and into the vessel itself. The blade remover comes into play again here too, as reviewers have said if you use it to tighten the blades sufficiently, you won’t get leakages. Don’t take this as gospel though, as others have found the RX leaks even with the tightest blade application. How Does It Compare to other models? Depends on whether or not you want or need the heating function, or just require a powerful blender for smoothies and drinks. If you need the heating, go for the RX. If you need a solid blender with good power, lots of functions and manual speeds, and you don’t need heating functions or portable cups, then go for the Blendtec. Again, it depends on your needs and preferences.The Breville is simpler, has smaller cups, a smaller wattage, and doesn’t have a heating function. The Magic Bullet is a good blender for making smaller batches of smoothies, shakes, dips, salsas, and grinding dry foods. But the RX has a lot more power, and larger vessels. I think the Ninja 1000 is more solid than the RX, and has less risk for issues (i.e. leaking and gasket troubles). It depends on whether or not the heating function is what you’re after, or if you just need a powerful blender for smoothies and drinks. If you need a personal blender, pitcher blender, and a food processor all with one base, then the Mega Kitchen System could be great for you. If you need a bullet blender for smoothies and the occasional soup, and you’ve already got a food processor, then the RX would be better. If you need an affordable bullet blender for personal smoothies and shakes, then I’d go for the Pro 900. If you need multiple smoothie servings and hot soups, the RX is better. Also, the RX has more power, so if you tend to blend tough ingredients such as frozen fruit and kale, the RX might be a smarter choice. The Ultima is pretty good, but since it’s discontinued you’ll have to get a refurbished one, if at all. If you need a pitcher as well as bullet cups, take another look at the Ninja Mega Kitchen System. The Auto iQ is a great blender, with more options for the user to control the blending duration. It doesn’t have a heating function, but it’s powerful and pretty affordable. Both great options depending on your needs. If you want to track your macros and calories, then the Balance could be a good choice. It’s less powerful than the RX, but still very powerful with 1200 watts. However, you do pay more for the smart technology so it’s best to decide if you really need it, otherwise go for a simpler model like the Pro 900. If you need the heating function then of course, the RX is better. If you want all of the weight loss accessories such as the portioned plate, 7-day plan, access to the LEAN app, and portion-controlled cups, then the Lean is a good choice. Otherwise, you’re just getting a bunch of accessories you don’t really need. You may as well get the RX instead, as you’re getting more power, and the option of heating soups and sauces as well as making smoothies. I like the accessories that come with the Prime, especially the flip-top lids and the stainless steel cup. If you just need a good blender for smoothies and shakes, I’d go for the Prime. The RX has more power, but the Select has the option of selecting the speed and function. If you prefer to have more control over your blending, and you don’t care about the heating function, then the Select might be better for you. If you’re in the market for a solid, long-lasting, pitcher blender to sit on your counter and be used for a wide range of tasks, then I would absolutely go for the Vitamix if your budget allows. It offers more versatility and control, and a much larger capacity. Are there other replacement parts or accessories? You can purchase a replacement extractor blade from Amazon and the Nutribullet RX website. Can I find it at other retailers such as costco, kohls, Macy’s, Target, Walmart or Walgreens? Where Can I Buy a Refurbished One? 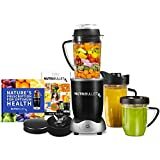 You can find certified refurbished Nutribullet RX’s on Amazon from a few different sellers. It comes with a 1-year warranty, but you can purchase an extended four-year warranty from NutriBullet if you wish. What’s The Best Price For The Nutribullet Rx and where can I buy it? Check regularly with Amazon to catch any sales or specials which may come up. Verdict: Is This Blender For You? The Nutribullet RX is a great blender, if you take the leaking and the slipping gaskets out of consideration. The wattage is awesome, the heating function is handy, and the blending power for smoothies is fabulous. Personally, I wouldn’t use a blender for making soups, as I’m just a more traditional cook. However, if you’re short of time and need a quick way to prepare hot, healthy soups then by all means, consider the RX. For something a little simpler, (i.e. for daily personal smoothies) and without the risk of gasket-slippage, something like the Nutribullet Pro 900 will serve you well.